This award was created in 2005 as a joint venture between NICB and the IAATI. It is intended to recognize any law enforcement person(s), unit or department, who have distinguished themselves in area of vehicle theft investigations, making a significant impact involving dismantlement and prosecution of a vehicle theft ring or chop shop. 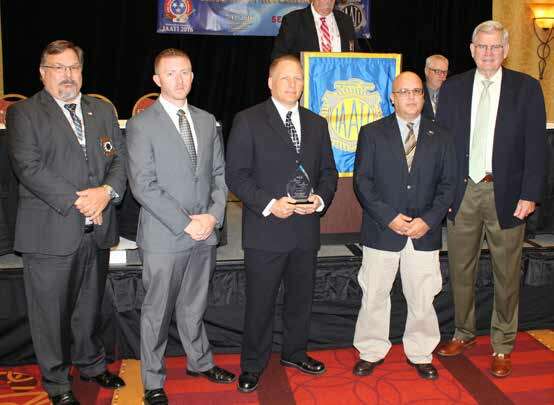 This year’s winners are the members of the Tucson Squad of the Arizona Department of Public Safety Rattler Vehicle Theft Taskforce; Ray Mechtel, Ryan Azuelo Kasey Ball, Mike Valencia, Clay Strahle, Steve Jimenez and Chief Ricardo Briseno with United States Customs and Border Protection . In early 2015 a trend was found indicating numerous Ford F250 and F350 trucks were being stolen in Tucson area and taken to Mexico. Tucson is approximately 70 miles from Nogales Mexico and many times vehicles are stolen in Tucson and have already crossed the border before the owner discovers the vehicle missing. The Arizona Department of Public Safety RATTLER Vehicle Theft Taskforce began an operation in an attempt to stem the tide of the F250s and F350s being stolen and taken to Mexico. A partnership was created between the AZDPS RATTLER taskforce, Tucson Police Department, Pima County Sheriff’s Office, Marana Police Department and US Customs in Nogales Arizona. The Tucson Police Department began sending text alerts to the taskforce members and US Customs in Nogales every time a F250 or F350 was stolen. The text alerts contained the vehicle information including the assigned license plates. US Customs would then then enter the license plates in the US Customs and Border Protection LPR system. This provided sufficient time for CBP to interdict the vehicle prior to getting into Mexico or the driver of the vehicle when they attempted to re-enter the US. The tactic proved to be very successful as it ultimately resulted in many arrests which otherwise would not have occurred. Through the use of intelligence collection (CAD reports, phone exploitation, pocket litter, statements, etc. ), they learned this was a trans-national organized crime syndicate, based out of Mexico, with ties to a trans-national drug and human trafficking organization. Additionally the taskforce detectives met with county prosecutors paving the way for successful prosecution of the suspects. Between January and June of 2015 the Task Force recovered 126 stolen vehicles valued at over $900,000. More importantly they made 42 in-progress auto theft arrests. For a single six-month period, these types of statistics are unprecedented for this region. This operation was conducted in conjunction with daily responsibilities of the detectives. This operation proved so successful some of the tactics are still being used. Just last week the US Customs in Nogales interdicted 7 stolen vehicle that resulted in 7 people arrested and charged with vehicle theft. NICB would like to thank the member of the taskforce for their dedication and resourcefulness to an ongoing vehicle theft problem by presenting them with the NICB award of Excellence. SIG Kyle Brady and Det. Kenneth Fields conducted an investigation into the thefts of heavy equipment stolen in the Evansville IN area which led to multiple subjects connected to other thefts from Illinois, Indiana, Kentucky, Missouri and North Carolina. Detective Fields, SIG Brady and NICB S/A Kevin Haggard identified 83 pieces of heavy equipment, commercial trucks and construction trailers with an estimated value of over $2,000,000.00 and for which 8 people were arrested. 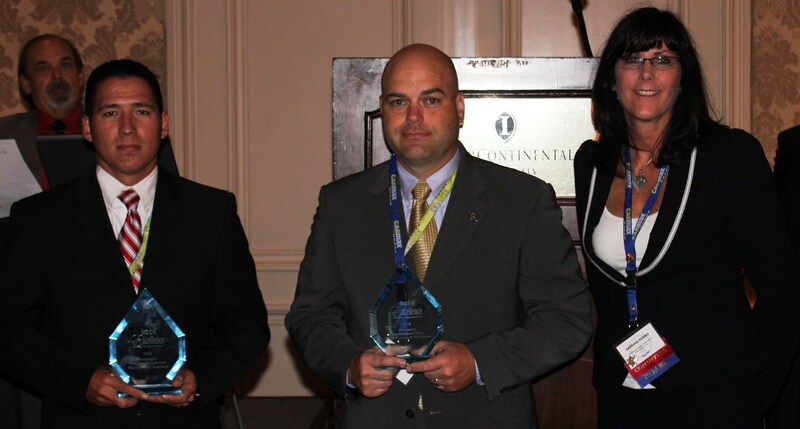 Detective Kenny Fields, Evansville, IN Police Dept Sp/Inv Kyle Brady, Travelers Ins. Co. The NICB Award of Excellence is intended to recognize any law enforcement person(s), or department who has distinguished themselves in area of vehicle theft investigations, making a significant impact involving dismantling and prosecution of a vehicle theft ring or chop shop. This year’s winners have done just that. New York Police Department Detectives Michael Simeone, Richard Straus and Daniel Fox conducted an investigation that lasted over 18 months and grew into one of the largest NYPD Auto Crime cases they have investigated. This case shows how through data analytics, GPS technology, wiretaps, and good old police surveillance, an investigation can be so successful. The steal crews were stealing the vehicles throughout the New York Metropolitan area tagging them and registering them with washed titles. Many of the vehicles were slated to be exported or to be sold to local or out of state buyers. Cooperation between the NYPD, NY DMV, NICB, and several other area law enforcement agencies lent to the immense success of this investigation. A total of 311 vehicles were involved in this case with an estimated value of over $15 million dollars. To date 32 people have been arrested. Congratulations to the winners! The NICB Award of Excellence is intended to recognize any law enforcement person(s), or department who has distinguished themselves in area of vehicle theft investigations, making a significant impact involving dismantlement and prosecution of a vehicle theft ring or chop shop. This year’s winners have done just that. In January 2012 Inspector Aaron Carver of the North Carolina Department of Motor Vehicles License & Theft Bureau received information from a citizen who believed they had spotted their stolen utility trailer on Craigslist. Inspector Carver took action and began searching through DMV records for the seller’s information. Carver located a possible match and upon viewing the satellite image of this person’s residence observed several utility trailers parked in front of the residence. Inspector Carver contacted NICB and ran the suspect through ISO ClaimSearch, confirming the suspect’s address and also obtaining a telephone number for the suspect. Inspector Carver discovered the suspect had previously fi led insurance claims in Los Angeles, CA and Ft. Lauderdale, Florida. Information that would later prove critical to this investigation! Inspector Carver discovered there were several reports of stolen utility trailers from Hickory North Carolina so he contacted Detective David Rockett of the Hickory Police Department. Although that initial lead failed to produce a recovery, it lead to the recovery of a different stolen trailer, which began a domino effect that would eventually result in the recovery of 42 vehicles valued at an estimated $443,714.00, and the disruption of a large scale organized theft ring which spanned from the west to east coast of the United States. Amazingly, the target of this investigation was not a career criminal (prior to this investigation) but rather a Hollywood actor who had played in a mini-series on cable. Working together, Carver and Rockett utilized all the tools at their disposal, including NICB. Their inter-agency cooperation is what contributed to the success of this investigation. This case could have easily been concluded at the recovery of the first stolen trailer; however, these officers took the initiative to go the extra mile and were relentless in their pursuit of justice. Because many of the vehicles recovered had altered/obliterated VIN’s Inspectors from NCDMV utilized NICB to obtain secondary VIN information and confirm the true identity of these vehicles/vessels, thus leading to the recoveries. Inspector Carver and Investigator Rockett display a firm understanding and embrace for the concept of teamwork which is critical to the success of any large scale investigation. of vehicle theft investigations, making a significant impact involving dismantlement and prosecution of a vehicle theft ring or chop shop. Northwest Indiana (Lake County) has consistently been a very popular area for both Commercial Theft and Personal Auto Theft rings due to the location between three major expressways connecting Illinois,Indiana, Ohio, and Michigan. As a result, the Lake County Sheriff made a request for an AUTO THEFT & COMMERCIAL sting operation to be established in Lake County Indiana. scale investigation. Many of these hours were during the late night or early mornings. Investigators diligently supported every aspect of this investigation and were the driving forces behind the successful dismantlement of these criminal enterprises. of more than 23 million dollars to consumers and victims. This joint investigative effort, with assistance from the DEA and the Lake County Prosecutor was one of the largest auto theft cases in Northwest Indiana. The investigation was initiated in November of 2009 and concluded by May of 2010 with arrest warrants for 28 individuals. In addition to the 28 arrests, 88 vehicles were recovered with a value $850,704. arrest, Discharging a firearm within City Limits, Operating a chop shop. IAATI and the National Insurance Crime Bureau (NICB) congratulate and acknowledge the 2010 NICB Award of Excellence recipients for their efforts and dedication to Operation “Sting 1”. They continuously made unselfish sacrifices for the advancement of this investigation. Editor’s note: Det. Bill Klause and Administrator Kara Ralowski could not attend the seminar and therefore were not in the photo. Colorado. Agents Doss and Hunter were an integral part in the success of Operational Dual Identity, one of the largest vehicle theft cases in the United States. been charged. This investigation was initiated in December 2006.
every aspect of this investigation and were the driving forces behind the successful dismantlement of this criminal enterprise. Congratulations and thank you to Stan Doss and Bijan Hunter for their diligence and a job well done. theft issue and close proximity to the U.S. / Mexican border, RATT was started as a pilot project in 1990 and became fully operational in 1992. Today, RATT consists of 26 Law Enforcement personnel from 14 Agencies and is operating throughout the San Diego County region along with the National Insurance Crime Bureau. RATT is receiving this year’s award, not only for the outstanding work and dedication by all members since its inception in 1992, but also as a result of “Operation Southside Blitz” which resulted in indictment of 91 vehicle theft suspects and warrants issued for an additional 6 suspects. “Operations Southside Blitz” also resulted in the recovery of 160 vehicles with an estimated value of 1.9 million dollars, not to mention various weapons and drug violations. “Operation Southside Blitz”, which involved an Undercover Storefront operation as well as undercover officers and the use of informant’s, was a very successful operation which shows the outstanding dedication and tireless efforts of all members of RATT. Special thanks to NICB Area 3 Director Ralph Lumpkin for the nomination which included the following details of “Operation Southside Blitz”. In the late fall of 2006, RATT Detective Marty Bolger began investigating several vehicle theft suspects working within the southern areas of San Diego County. Through analysis of vehicle theft statistics and information from cooperating individuals, Detective Bolger developed a RATT operational plan to address the regional vehicle theft problem. The operation was entitled “Southside Blitz” and would include the use of an undercover storefront, informants and undercover detectives to identify and infiltrate the various criminal networks operating throughout the county. On January 8, 2007, the storefront opened for business. Detective Bolger was designated as the operations case agent. Detective Andrew Golembiewski was assigned co-case agent. Detectives Paul Winslow and John Clements were utilized as undercover officers. The remainder of the task force provided officer safety support and surveillance for the undercover officers and assisted in suspect identification. The Bureau of Alcohol, Tobacco and Firearms (ATF) assisted in the operation by providing RATT with both audio and video surveillance equipment in and around the storefront location, along with the use of two undercover agents. The use of the storefront added legitimacy to the stories undercover officers told their targets. Once the initial contact with a vehicle theft suspect was made, undercover officers would arrange to buy a stolen car, firearms or narcotics at an off-site location from the storefront. The location was monitored by a pole camera and surveillance officers. Normally, after the first contact, the undercover officers would inform the suspects that they felt comfortable the suspects were not “cops.” The suspects would then be “invited” to the storefront for subsequent illegal transactions. The storefront closed in July, 2007, however, the operation continued through October, 2007.
for two separate homicides. One of the suspects was involved in a large narcotic/illegal immigrant smuggling ring. At the time of his arrest, a large two story underground bunker was discovered under the residence, complete with lighting and water. The bunker was used to conceal the illegal activities of the suspects, including weapons, narcotics, and vehicle theft. charges related to the operation. Arrests continue to be made and to date, seven suspects are still outstanding. Sentencing for these defendants range anywhere from three years to 152 years, including life in prison. portions of the county, every part of San Diego County was impacted by the criminal networks identified in this undercover operation. The local media provided significant coverage of the “take down” and subsequent press conference where the highlights of the undercover operation were disclosed. to RATT by donating $15,000 to help offset operational expenses. Without the support of stakeholders like NICB, impacted by the cost of vehicle theft, these types of operations would not be possible. Every member of RATT was instrumental in the success of Operation Southside Blitz. Coordination of such a large and complex investigation required countless hours of investigative work and follow- up. The case agents did an outstanding job in managing such an involved and intricate operation. The undercover officers were very convincing as “crooks” and gained the trust of the unsuspecting targets in the operation. The surveillance and officer safety teams provided excellent coverage and security for the undercover officers. The Deputy District Attorneys assigned to the task force were tenacious in the charges and prosecution of the defendants. As a proactive task force, RATT has focused on and found success in utilizing covert methods to identify and infiltrate the criminal organizations that prey on all members of our community. In conducting these types of undercover operations, the efforts of RATT will result in a safer environment for the citizens of San Diego County.